Duplicate or dock a SATA SSD/HDD with fast performance – works with both USB-C and USB-A enabled devices. Duplicate drives quickly, at rates of up to 28GB per minute for SSDs, without having to connect to your computer. This duplicator dock offers standalone drive cloning that makes it easy to back up your data and make exact images of your drives. You can also connect the dock to your computer through USB 3.1 (10Gbps), to dock and swap your drives as part of a scalable storage solution. Clone drives at high speed Duplicating a hard drive or solid-state drive is an effective way to migrate your operating system and data from one drive to another, or create an exact copy for safeguarding important data. This drive duplicator lets you create a sector-by-sector clone of your drive, including partitions and boot sector information, to ensure data integrity and consistency for sensitive operations such as data recovery. The duplicator dock saves valuable time with SSD duplication speeds of up to 28GB per minute. You can duplicate a 2.5” or 3.5” SATA SSD or HDD, without connecting to a host computer. Transfer files quickly between dock and PC The duplicator dock also lets you dock drives through USB 3.1 with UASP support, enabling fast data transfer rates of up to 10Gbps. Each drive slot supports a high-capacity drive, tested up to 6 TB. Includes two USB cables for versatility The duplicator dock comes with two USB cables (USB-C to B and USB-A to B) for flexible use with the latest laptops and tablets equipped with a USB-C port, as well as legacy devices. It is also compatible with a Thunderbolt 3 USB-C port. Designed for easy use The dock features a top-loading, toaster-style design for fast and easy drive insertions. The HDD ejection button enables quick drive removal. For added compatibility, the SDOCK2U33RE supports the use of various drive adapters. 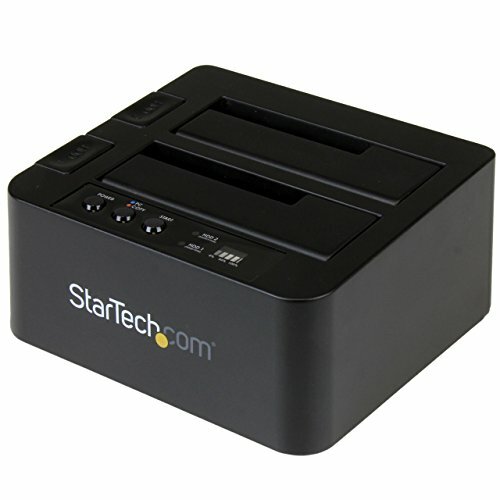 The SDOCK2U313R is backed by a StarTech.com 2-year warranty and free lifetime technical support.